For the last 4 years the Maldonado family has volunteered with CAWL fostering dogs, cats, puppies and kittens. This family has never turned away an animal in need, they are incredibly caring and compassionate. Dozens of lucky animals have spent time in their home and with their amazing daughter, Katie. Today was really special as Katie was surprised and honored by a local optometrist, Dr. Michael Vaske, of Vaske Vision Care. 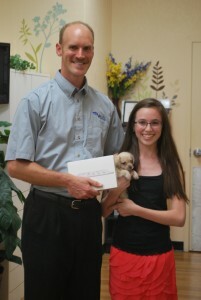 Dr. Vakse offered an iPad mini for the winner of his good deed contest and the best volunteer in Parker, Colorado. Many essays about good deeds came in but the choice was Katie! She single handedly saved more than a dozen kittens in one summer vacation! Katie loves to care for and socialize the dogs and cats and also loves dance and horses. She is an excellent student and all around amazing young lady. The Maldado family runs an in home doggie daycare and boarding facility for other lucky owned animals as well called Furever Furry. They are almost always fuller than full but if you can get your pet in, they will take great care of them while you are away! Check them out on Facebook. Thank you so much to Dr. Vaske for making today extra special at CAWL! We are super proud of our special volunteer!